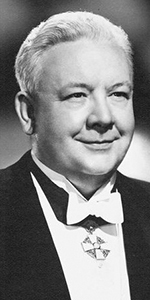 Lauritz Melchior was a Danish-born opera singer in the tenor range. After becoming the standard-bearer in the Wagnerian roles both in Europe and America, he was featured in films, which made him something of a crossover celebrity. We believe that he is the only personality from the world of opera represented in the Forecourt. Born in Copenhagen Denmark, Lauritz performed as a boy soprano before beginning his singing studies at the Royal Opera School in 1908. He made his debut at the Royal Opera playing Silvio in Pagliacci. He toured in small Scandanavian opera companies for the next several years. One night while appearing in a production of Il Trovatore, Melchior met the soprano Madame Charles Cahier, who suggested that he should reconsider his playing baritone roles, and take on the tenor register. Studying with Danish tenor Vilhelm Herold led to Melchior having a low range for a tenor, but with a stirring high extension. He made his tenor debut at the Royal Opera in Tannhäuser in 1918. In 1920, Melchior met author Hugh Walpole, with the two starting a mentorship for the young singer, support which allowed him to study at the Vienna State Opera with soprano Anna Bahr von Mildenburg. Word of Melchior's talent traveled quickly to the Bayreuth Festival, where Wagner's widow, Cosima, had him perform both Siegmund and Parsifal. Melchior made his Metropolitan Opera debut in Tannhäuser in 1926, but he was cooly received. To gain even more experience out of the spotlight, he worked with the Hamburg State Opera, appearing in Lohengrin, Othello, and Aida. Acceptance at the Metropolitain finally came in 1929, with his performance in Tristan und Isolde. Melchior became one of the Met's most popular Wagnerian performers, apprearing in over 500 performances of Wagnerian roles between 1929 and 1950. He was also very popular at Covent Garden before World War II, in Buenos Aires, in San Francisco, and Chicago. In the mid 1940s, Melchior decided to appear in films for Metro-Goldwyn-Mayer and Paramount. His first film was the Esther Williams Technicolor musical Thrill of a Romance (released in May, 1945), where he plays an opera singer who just happens to be staying at the same resort, Two Sisters from Boston with Kathryn Grayson (released in April, 1946), where he plays a fussy opera singer, and This Time for Keeps (released in October, 1947), again with Esther Williams, where he plays — an opera singer! who wants his son to follow in his footsteps. While these films might not sound all that great, they were all substantial successes, with Melchior becoming not only the only opera star (so far) to be in the Forecourt, but also the best contract bridge player (he holds several world records still), and also has the biggest feet (size 13.5). Melchior returned to the movie cameras for the Jane Powell musical Luxury Liner (released in September, 1948), were he plays an opera singer on a voyage full of people who want to stage a musical. After this, Melchior went on a world tour through 1949 with his conductor Ezra Rachlin. He did a 19 week run at the Palace in New York City. He then returned to Hollywood to appear in the Rosemary Clooney musical The Stars are Singing (released in March, 1953), where he gets to sing his big number from Pagliacci. Retiring in 1955, Melchior appeared on television a great deal, including What's My Line? in 1951, The Ed Sullivan Show in 1950, The Jimmy Durante Show in 1954, The Lux Show in 1958, This Is Your Life in 1958, Make Room for Daddy in 1959, The Arthur Murray Party as late as 1959, The Tonight Show in 1964, and The Merv Griffin Show in 1965. Melchior's final appearance was to sing the first act of Die Walkure for Danish radio in 1960. He conducted the San Francisco Opera Orchestra during the summer season of 1972. Melchior died of an undisclosed illness in Santa Monica in 1973, at the age of 83. Grauman's Chinese Theatre, Hollywood, California. 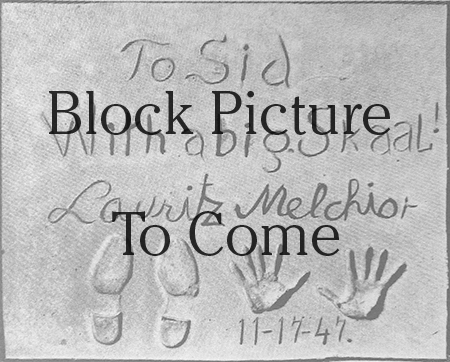 Lauritz Melchior Forecourt ceremony, Monday, November 17, 1947. 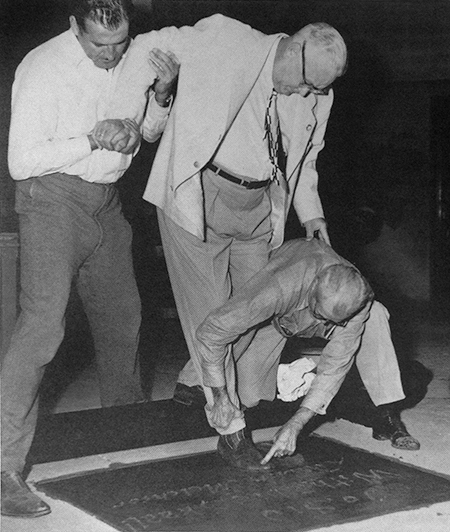 An unidentified man helps steady Lauritz Melchior as cement artist Jean Klossner makes an impression of his rather large shoe into the cement.